Experience a tailored workshop that covers topics like plant-based cooking, nutrition and herbal medicine that fit the needs of your church, school, or organization etc. Spice Up Your Plate - a workshop on learning the art of integrating spices and herbs while cooking. 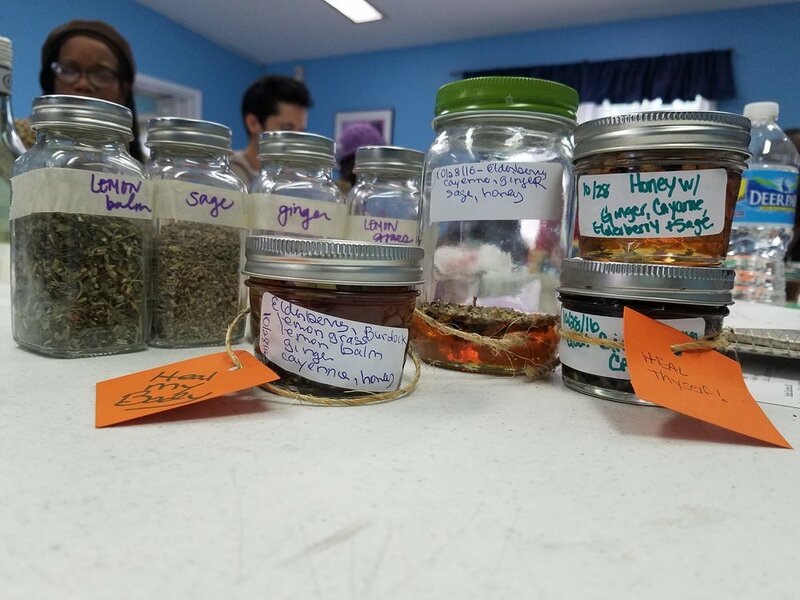 Participants take home a homemade spice mix. DIY Cold Season Tincture Making - a workshop on learning about the safeness of homemade cough syrups and herbs. Participants take home a homemade cold season tincture (cough syrup). Let’s Make Fire Cider! - a workshop on immune health during the cold weather season. Participants take home homemade fire cider (an immune boosting elixir). If you are interested in learning more or receiving a quote, please fill out the form below! What date would you like the workshop to be? If the date is flexible, please leave this question blank. Priority will be given to audiences of Black women and children. Sistah of the Yam provides education for workshops. It is your responsibility to recruit attendees for the workshop. As a way of respecting our time and resources, we reserve the right to cancel a workshop (with no refund) if no one attends. Sistah of the Yam does not conduct "free" workshops. We are however open to donations, bartering, and sliding scale fees as a way of ensuring mutual integrity. Thank you for your request! We will be in touch within 7 business days. Are you interested in inviting Taylor to speak at your event/organization? Please read the following basic criteria below. 2. Fair honorarium and/or compensation. Honorarium begins at $500. Opportunities outside of Philadelphia County must include compensation for travel and/or lodging in order to be considered. 3. Family friendly. Priority consideration will be given to requests that allow for Taylor to care for/bring her daughter and husband. Why plant-based eating isn't "a white thing"
If your request meets the basic criteria above, please fill out the form below. We will be in touch within 7 business days. If your organization and/or event does not have a website, please write "N/A"
Please provide the aproximate date(s) of your event. Is there anything else you would like to share about your event?